To do this, add ‘meta-data’. Think of these meta tags as information about information. Adding meta data to each page can really help your site but abusing them and not following our advice WILL at-best make the search engines ignore your pages, at-worst really harm your site and get it black-listed. To change the meta tags click step 3 on your control panel . 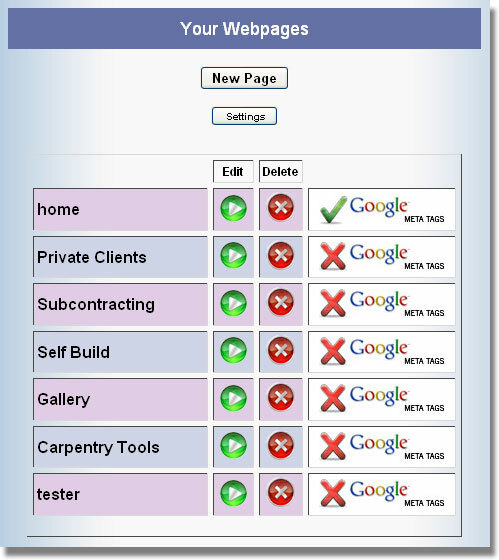 You will see a list of all the webpages that you have created. On the right is a Google image showing a cross or a tick. To set the meta tags for a page click the image. A table will open up allowing you to change the meta tags for a page. If the text that appears is RED then it is system generated. If it is Blue then it is user generated. Below each box is a link that says ‘you must read this’. Click this link and read the instructions for each box. They are different for each meta tag and you must follow the advice here closely. Once you have entered your meta tags, click the [Submit] button at the bottom and the Google icon will show a tick indicating that at least one meta tag has been changed for this page. If you want to get rid of the meta tags that you have entered then delete the content of ALL meta tag boxes and the system will replace it with its own data instead.